This leaflet refers to a 'Caxton celebration', evidently an exhibition of printing-related technology at the time. William Caxton established the first printing press in England in 1476. Printing was then calligraphic: that is to say it imitated handwriting. It was a very expensive process and only the wealthy could afford to purchase printed materials. 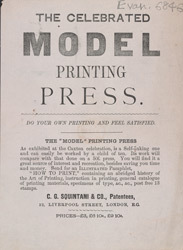 Printing developed from a hand-craft to a technology during the Victorian period. Machinery became more sophisticated and new printing processes, such as lithography, were developed. Limited colour printing was also available for the first time. Machines such as this were very popular with small firms that wanted to do internal printing.